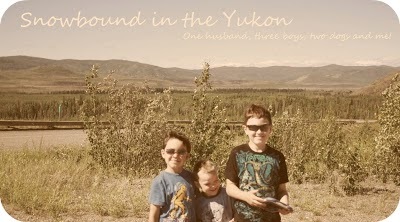 Snowbound in the Yukon: Musings! I just wish I had something meaningful to say. Life is all about babies, toddlers, and school age children. Why do I have so many children? I ask myself this question but I couldn't imagine not having any of them in my life. It's 10 o'clock at night and Little One is still up. He's driving me crazing with these schedule changes but he's got a good excuse teething plus cold. Meanwhile the other two are getting down earlier each night. I can tell too, when they are tired because boy oh boy do they get cranky. So anyway, I've been thinking a little about what life without children would have been like. I imagine that I would have been having a grand old time, traveling and getting out and about with friends, I'd have money and my dog would still be with me. So many little things. Really, seriously I could care less, while I may me harried, stressed out and at my wits end a lot of the time I wouldn't change a thing. The woulda, shoulda, coulda's can really kill you! I don't usually do such things but lately I'm thinking about work again. Less than 5 months until I have to go back. It's not that I hate my job but it's so routine and boring, nothing seems to change there or present a challenge. Sometimes I'll get someone in looking for something and I'll do my searches or do this little project but sometimes I don't think it's enough. I should just write a book while I'm there, I have a few ideas for novels and I just haven't seemed to find the time to get them down on paper. I'm pretty satisfied with my life though, I'm sure that time will make things even better as the children grow and demand less of my time, I may be able to find myself again because right now I feel like my only identity is mother and wife. I want to be writer or something. Hubby expressed his desire for me to stay home as well. I don't think I'm cut out to be a stay-at-home mother and right now with all of our expenses it's just not feasible. If hubby was making the kind of money he makes for five months of year, year round I'd consider it but right now I feel tremendous pressure to work and because I want to sustain our current lifestyle for now. Especially if we would like to buy land and build in the next few years. I feel like I am constantly saying in the next few years and it hasn't changed in the last few years. We'll make it I know, damn well better on the money we make now, we just have to pay off hubby's business loan and then our van now! So in the meantime, I'll bide my time and work and be mom! I think my DH would like me to continue to be a SAHM too...but we have debt we want to get out of, we want to buy a home, and I have student loans to pay off. We can't do it on one income. It's just too hard these days.